"Now, I think, is the right time to be an entrepreneur. When everything slows down, you open your business- it’s the best time. Suppliers will be more flexible, payments will be better, office rents are going down- setting up something new, [the time to do that] is today.” At a time when there seems to be a lot of questions being asked about the economic stability of the UAE and the wider Middle East, the above statement by AJSM Investments Chairman HH Sheikh Saeed Obaid Al Maktoum puts a different spin on the conversation in the region- and it’s safe to say that wannabe entrepreneurs would be wise to take note of this seasoned businessman’s words. As the man leading a company with interests in sectors as varied as real estate, technology, F&B and pharmaceuticals, Sheikh Saeed knows a thing or two about doing business in the UAE- AJSM Investments has been seeing rapid growth since its inception about four years ago, with revenues increasing by 80-100% in Sheikh Saeed has a calm, charming demeanor, but when he talks about anything relating to entrepreneurship, his passion for the subject is almost tangible- it’s clear that this is someone who is eager to see more entrepreneurs rise up in the UAE. “Starting your own business –given all the facilities that you have around today- it’s 10 times easier to do it now than it was 20 years ago,” he notes. “The government is pushing for it, the services are there- it’s so much easier than before.” But shouldn’t one be concerned about the uncertainty in the market right now? Sheikh Saeed dismisses this contention, and points our attention instead to the advantages inherent in the current financial climate for the entrepreneur. “Failing today is less [of a risk] than failing in two or three years’ time,” he says, smiling. “It will cost you less!” In addition, Sheikh Saeed also explains how starting up a business, say, three years later as opposed to now doesn’t offer any guarantee of ease in the entrepreneurial journey ahead- according to him, the process (and the costs involved) will only get tougher in the years to come. AJSM Investments came into being after Sheikh Saeed and his four siblings decided to bring their respective family businesses together as one unit. Besides the “greater good” associated with pooling these companies together, Sheikh Saeed noted how coming together also allowed them to make bigger investments than what they’d be able to do previously- and thus enable better returns as well. Real estate development was at the core of the business when AJSM Investments started out, and it remains an integral part of the company today, but diversification efforts are well underway, as is being showcased by its move to start a pharmaceuticals factory producing generic medicine. Sheikh Saeed is also particularly interested in the tech sector- one of AJSM Investments’ ventures in this space has been working with Idea Prodigies, a software development firm, to develop an app called MyHUBBER, which has been billed as “a multi-purpose mobile and web application for social networking, classifieds, and shopping.” Besides the app (which is expected to launch by the end of the year), Sheikh Saeed is also hoping to launch an Islamic crowdfunding website as well, tapping it as a platform to both fund businesses as well as to facilitate Islamic charitable giving not just in the MENA region, but around the globe. AJSM Investments Chairman HH Sheikh Saeed. Image credit: XTREMEPICS. 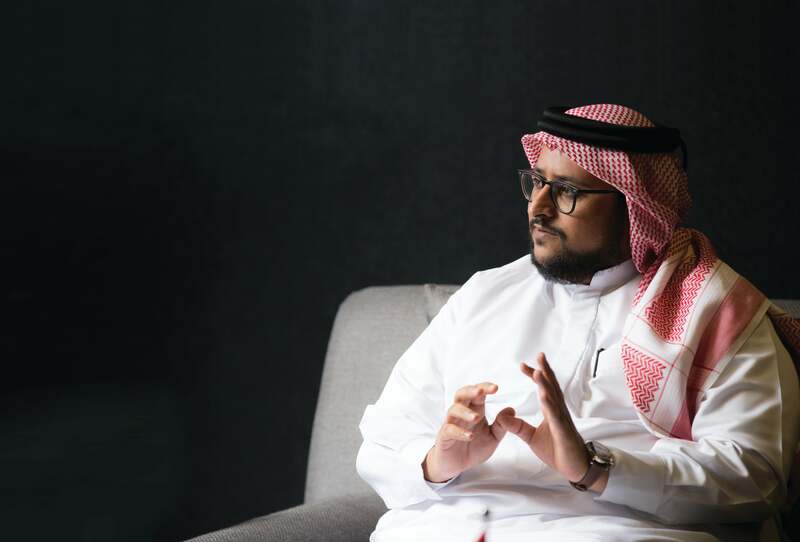 Given his own experience in the business world, Sheikh Saeed is emphatic on the need for entrepreneurs to have a good support structure, be it in the form of family, friends or peers in business. “In the beginning, I was lucky,” he recalls. “I had a very supportive family. I failed quite a bit in a few small businesses at the beginning, and every time I failed, they were there for me. They were like, ‘Don’t stop, do something else, make it better.” So I always had support. And this is the best feeling, I think, you can have as an entrepreneur- having someone behind you, having your back. If you fall, someone will pick you up… The satisfaction one can get out of this is one of the best feelings you can have, and if I can, in some way, help even 1% of the community with something like this, I’ll be more than happy.” At this point, I quiz Sheikh Saeed on what’s his personal motivation to want to do things like this- what does he actually get out of supporting and encouraging entrepreneurs in the UAE? I’ll admit here that I was expecting a standard corporate response from him on this, but Sheikh Saeed’s rather innocent answer took me off guard. “Making people happy makes me happy,” he says, in a matter-of-fact way. “I find happiness from seeing other people being happy.” It’s a simplistic statement, true, and one can argue that it is a bit naïve to even think that with respect to the business world. But it’s clear that Sheikh Saeed strongly believes in this notion of his, and given the current disjointed nature of the UAE’s entrepreneurial ecosystem, maybe such a sentiment is what is required to bring it together as a more cohesive whole- and yes, the community will only be the better for it. Entrepreneur Middle East Managing Editor Aby Sam Thomas with AJSM Investments Chairman HH Sheikh Saeed. Image credit: XTREMEPICS. 5. Remember to keep learning “Always surround yourself with people you can learn from. There’s no one that knows everything, so surround yourself with people you can get knowledge from… Always grow yourself."